WADADA has been one of the most creative composers and trumpeters in Jazz for the past half-century, and is finally attaining the legendary status he deserves. A founding member of the AACM and a 2013 Pulitzer Prize finalist for his masterwork about the Civil Rights Movement, Ten Freedom Summers, Wadada was the Jazz Times Artist of the Year in 2016 as well as a recipient of the coveted Doris Duke Performing Artist Award. In 2017 the awards have kept coming, with the Jazz Journalists Association naming him Artist of the Year, and Wadada's mesmerizing duo with pianist Vijay Iyer the Duo or Trio of the Year. Perhaps the only artist in history to be featured on the cover of Downbeat, twice in less than a year, Wadada received a trifecta of awards from that prestigious publication: Artist, Trumpeter, and Album of the Year, for his new Cuneiform CD America's National Parks. To create that masterpiece Wadada expanded the Golden Quartet, his working band with John Lindberg on bass, Anthony Davis on piano, and Pheeroan akLaff on drums, to create a Golden Quintet with Ashley Walters on cello. Their live performances also include the hypnotic visual imagery of video artist Jesse Gilbert. 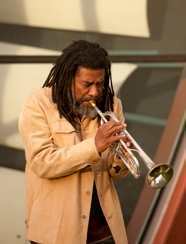 Wadada's touring priority in 2018 will be America's National Parks, or for those presenters who can't afford that, his solo trumpet 100th Birthday tribute to Monk, which will be released on CD by Cuneiform in October 2017. IT'S WADADA'S TIME, so GIVE ME A CALL.